Perhaps above all the others, Buck Knives is the brand that sticks out because of the high-quality and elegant looking folding hunting knives. The best part about this brand (other than their sharp blades) is how much they honor tradition. You don’t have to be a hunter to appreciate this company, though. They also make superb tactical knives, survival knives, fishing blades, cutlery and everyday carry knives. If you’re looking for the Mercedes of knives, then Buck certainly has something for you. Before we jump into their top 6 knives for everyday and hunting, check out these fun facts about the company. Buck is all about tradition. The founder, Hoyt Buck, started the company in 1902, when he has making every single knife by hand. Eventually moving to San Diego, Hoyt set up shop and made 25 knives a day by hand until his death. Now, decades later, the company is still run by the Buck family. 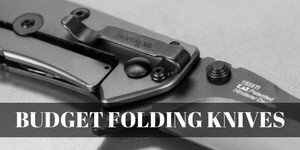 They lay claim to being the inventor of the “folding-hunting knife,” which has been the most popular type of consumer EDC knife for over 30 years. 1964, the company released the Buck 110, the knife that started the folding-hunting knife craze. It’s still their most popular knife to date. We have to start the list with Buck Knives’ most famous knife. Like all good innovations, this knife was born out of a man’s desire to fix a problem. Al Buck decided that huntsman needed a reliable, tough blade that wasn’t fixed - but could fold in like a pocket knife. The Buck 110 was born, and within 6 months was the most popular hunting knife in America. This knife is also gorgeous. The wooden detail work with copper fixtures is elegant as can be. This is still Buck Knives best-selling product. This is the everyman’s first knife. If you need a good-looking, tough knife on any budget, the Bantam is perfect. This is a classic folding knife, and has a 2.75” blade made of 420HC steel. It carries the Buck name, so you know that it’s durable enough for everyday tasks. This is one of the best selling fixed blade hunting knives on the market, and for good reason. This is the type of knife that founder Hoyt Buck made by hand after he learned the blacksmith trade. This knife is designed for hunting. The 6” blade is longer than it used to be made, which gives you extra control and detail for carving after the hunt. And beyond that, it’s just a beautiful knife. Every Buck 119 includes a Genuine Leather sheath for safe carrying. The folding hunter knife market started with the 110. But sometimes, you can’t take such a big, badass knife with you. In some places, you can’t legally carry blades of a certain length. When the Navy banned long blades for their crew members, the 110 was out. So Buck got smart and invented the 112 Ranger. It’s essentially the 110, but the blade is only 3” long. It’s just as tough and just as pretty. Perfect if you want a knife with all the power that you can take anywhere. I’m going to be honest, this is a funky looking knife. But you know as well as I do that form follows function. This assisted-opening knife uses ASAP Technology, and it uses convenient ambidextrous opening studs. If you’re looking for quick draw power, you’ve found it. Like most Buck Knives, this knife uses 420HC steel. That and the drop-point blade shape guarantee that it’s strong enough for any daily task. The durability and speed of this knife make it ideal for self-defense. The name “Toothpick” is very telling. This is more of a pocket knife than a hunting knife. If you’re looking for an everyday carry to replace a box-cutter, this is it. The Toothpick blade is made from 420J2 steel. This steel is perfect because it’s easy to sharpen. That makes it perfect for routine. And the Toothpick uses the same gorgeous detailing as the classic 110 - a wood grain handle with copper detail. This knife has class. There you have it, the best knives made by the classiest company. Whether you’re looking for an EDC for routine tasks, or you’re looking for a knife to clean game after the hunt, look no further than Buck Knives.